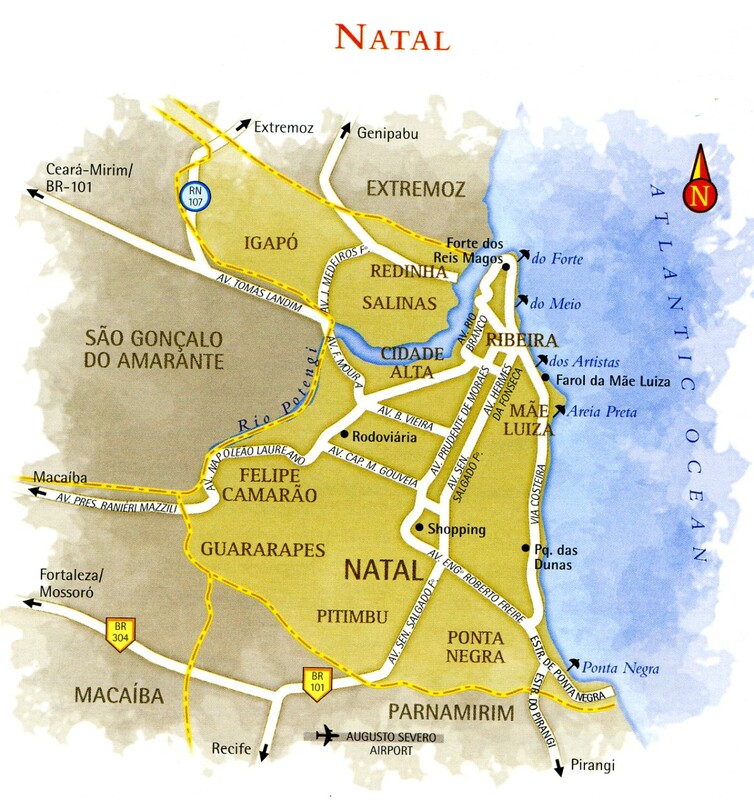 On December 25, 1599, the Portuguese celebrated mass on the site of the original Potiguar settlement, naming it "Natal" ("Christmas") to commemorate the event. The state capital's year-round sunshine and friendly reputation earned it the nickname "Bride of the Sun" from to folklorist Luis da Camara Cascudo. Via Costeira is the city's main drag and the site of most facilities for travelers. The coastal avenue links the city center, in the higher part of town, to Ponta Negra, Natal's nightlife hotspot. Natal is also the main departure point for dune buggy excursions to the famous Genipabu dunes (north of the Potengi River) and to the magnificent north and south coasts. Built by the Portuguese as protection against the French, the five-pointed Forte dos Reis Magos is strategically positioned at the Potengi River's meeting with the ocean. The Portuguese broke ground for the fortress in 1598, on the day of the Feast of the Epiphany (January 6). Since that feast celebrates the visit of the three Magi to see the baby Jesus, the star-shaped fort is called "Fort of the Magi". The wattle and daub walls were replaced with stone in 1628. Today visitors reach the well-preserved fort by an 800-meter walkway over marshland. The views of Natal, the ocean, and the river from the fort are unforgettable. An arms museum inside displays the Marco de Touros, a limestone block inscribed with the king of Portugal's cross and sword insignia. It originally stood on Praia do Marco, in São Miguel do Gostoso, signifying that the surrounding lands were Portuguese possessions. The fort's captain's quarters features a small exhibition of objects found during excavation work. More disturbing are the three torture chambers in the fort's underground dungeon. A particularly gruesome chamber features a deep hole that, when filled with sea water, drowned the prisoners held there. Praia do Forte. One hundred fifty spiraling steps lead to the highest point in Natal, the Farol de Mae Luiza, also called the Farol de Natal. (Rua Camaragibe, Mãe Luiza). Opened in 1951, the lighthouse is 37 meters high, but stands at 87 meters above sea level (with visibility of 39 nautical miles out to sea) because it was built on a sand dune. The 360-degree view from the top is one of Natal's finest, taking in parts of the Parque Estadual Dunas de Natal (also known as the Parque das Dunas, or Dune Park). The park was Rio Grande do Norte's first conservation area, created in 1977. Part of the Brazilian Atlantic Forest Biosphere Reserve since 1994, the park is a 1,172-hectare (2,896-acre) tree-covered dune. The park is well-cared for and has excellent signage. It offers hiking trails, a playground, an amphitheater, a picnic area, and a visitor's center, which arranges trips to the vivarium. The center also displays park photographs and offers restrooms and drinking water. Several guided walks are available: Perobinha (800 meters roundtrip) is suitable for children. Beroba (2,800 meters round-trip) visits Barreira Roxa lookout point. Ubaia Doce (4,400 meters round-trip) is a difficult walk along steep slopes. Avenida Alexandrino de Alencar. With the exception of the Ribeira neighborhood, the central areas of Natal are deserted at night. It's a striking contrast to the city's nighttime beach scene, where an active nightlife centers on the beach at Ponta Negra, near Morro do Careca hill (closed to traffic to protect the dune from erosion). On this stretch of coast, shops, restaurants, and live-music bars stay open late, attracting travelers, the bugueiros (dune buggy drivers) who accompany them, and local youth. For a quieter night, walk away from the hill along the pleasant stone promenade. Natal's residential neighborhoods are mostly in the upper part of the city, Cidade Alta. The lower part of the city is mostly historic. The rainwater that collected there drained to the Potengi River, earning the lower district neighborhood the name Ribeira ("Floodplain"). These upper and lower parts of Natal are home to the city's oldest buildings and squares, often overlooked in favor of coastal attractions. The neo-classical Instituto Histórico e Geografico do Rio Grande do Norte (Rua da Conceiҫão, 622) features everything from rare books to a baptismal font. The entrance to Cidade Alta is marked by the Coluna Capitolina, a gift of Benito Mussolini to reciprocate the warm welcome Natal gave to two Italian pilots who landed here in 1928. Don't miss the tiny Museu Café Filho Norte (Rua da Conceiҫão, 601, Ribeira), which houses the personal effects of Joao Café Filho, a Rio Grande do Norte native who served as president of Brazil in 1954 and 1955 (in the aftermath of President Getulio Vargas's suicide). Built between 1816 and 1820, the museum's Iphan-protected building is called the "bridal veil" because of its steeply sloped white roof. The Teatro Alberto Maranhão (Praҫa Augusto Severo, Ribeira) is Rio Grande do Norte's most important theater, founded in 1904 by the governor who gave it his name. In addition to its dazzling interior - patterned floor tiles, giant crystal mirrors, and handsome chandeliers - the theater features a small garden and cafe. The impressive auditorium has a unique, inlaid Belgian tile floor and two tiers of wooden seating for up to 642 people. The historic Ribeira neighborhood is a highlight of Natal's lower city. Lovely cobblestone Rua Chile is the neighborhood's heart. During the day, the fish trade near the port is the main order of business, but after sunset, the city's life is in its nightclubs. A unique city sight is the Pedra do Rosário, also known as the Paҫo da Patria, a deck on the Porengi River featuring a statue of the Virgin Mary. According to folklorist Camara Cascudo, a box containing a statue of the Virgin Mary washed up on the site in 1753, on the feas t day of the Presentation of the Blessed Virgin Mary. As a result, Nossa Senhora da Apresentaҫão (Our Lady of the Presentation) became the patroness and protector of Natal. The original 1753 statue stands in the city's cathedral. Today the deck, surrounded by boats, is an ideal spot to enjoy the sunset. Nearby is the famous Canto do Mangue, a series of small quays where fishermen sell their fresh catches in the early morning hours. The Centro de Lanҫamento da Barreira do Inferno takes its name from the 28-meter red cliff named the Barreira do Inferno (barrier of hell) by local fishermen. The launch center is on a strip of coast between two beaches, Ponta Negra to the north and Pium to th e south, in the municipality of Nova Parnamirim. The rocket launch site was created in 1965, though the main launch pad has since been transferred to Alcantara, in Maranhão. Today the center gathers meteorological information and exhibits replicas of launched rockets. Its two former launch pads are visible in the distance from a lookout point. Visits to the center must be prearranged and accompanied by a guide, since the area belongs to the Brazilian Army. A car is required, as there are long drives inside the complex. RN-063 highway, Km 11. Flavio Freitas and Dorian Gray are Natal's most prestigious artists. Flavio Freitas paints huge contemporary figurative works in acrylics and oil s.
He also does woodcut prints. His signature colors are red and ochre. Rua Duque de Caxias, 182, Ribeira). Dorian Gray, a painter, illustrator, engraver, poet, and author of more than thirty books, draws prolific inspiration from the land, folklore, and regional themes. His name comes from his father's pass ion for Oscar Wilde's book The Portrait of Dorian Gray. In 1955, Gray painted O Cangaceiro (The Bandit), a portrait of Lampião. The painting now stands at the entrance of the Casa de Camara Cascudo, a museum dedicated to Gray's great friend and fellow writer Luís da Camara Cascudo (Studio: Avenida Nascimento de Castro, 190A, Lagoa Nova). The folklorist, historian, and ethnographer Luís da Camara Cascudo (1898- 1986) was born at Chacara Tirol, a rural property that became the neighborhood of Tirol. The author of numerous works, he explained Brazilian folk culture with erudition and humor. Natal's favorite son is commemorated at two city sites. The Casa de Camara Cascudo museum (Avenida Camara Cascudo, 377) is in the house where the scholar lived for forty years. The collection features messages from visitors and illustrious writer friends, as well as books and furniture. His table, desk, and typewriter are preserved exactly as he used them, covered by a Peruvian cloth. Dona Geralda da Silva Oliveira, who cares for the house, can tell stories about the writer. The Memorial Camara Cascudo (Praҫa André de Albuquerque, 30) houses unique personal items (the agate basin in which he was first bathed and the cigars he smoked compulsively), as well as notebooks, newspaper clippings, and first and revised editions of his books. The second floor houses his 10,000-volume library. Note that the small Museum Camara Cascudo is a natural history museum named for the scholar, but with no connection to him nor any historical items related to him. The Centro de Turismo comprises 38 stores (including a snack bar) surrounding a historic 19th century building. The building was a shelter for the poor at the beginning of the 20th century, a girls' orphanage from 1920 to 1943, and a prison from 1945 to 1969. The stores sell clothes, toys, and souvenirs, including embroidery from Caicó, cantativa palm straw boxes, and sisal items. At Store # 2, the Cooperativa de Produtores Artesanais do Rio Grande do Norte sells exquisite craftwork from the municipalities of Goianinha, Várzea, Espírito Santo, São Gonҫalo do Amarantes, Apodi, Santo Antonio and Santa Cruz. Rua Aderbal de Figueiredo, 980, Petrópolis. Praia de Ponta Negra is a long beach met by rough seas, making some spots good for surfing. Small kiosks sell coconut juice to walkers and runners along the promenade in the early morning and late afternoon. Ponta Negra and the string of beaches that follow it are backed by the Via Costeira. This main coastal road is marked by nearly 13 kilometers of hotels, including Natal's biggest and most luxurious accommodations. Most of the beaches have rougher seas and are frequented mostly by travelers, who alternate between the ocean and hotel pools overlooking the beaches. The first beach after Ponta Negra is Barreira d'Agua, followed by Areia Preta (which runs parallel to the Parque das Dunas). At the end of the Via Costeira is Praia dos Artistas, which is popular with young surfers (especially in the afternoon). With fewer tourist facilities than Ponta Negra, Artistas beach is more popular with locals. The next two beaches are Praia do Meio and Praia do Forte. Both have calm, shallow seas protected by reefs. A stretch near Praia do Forte, where the Potengi River empties into the sea, offers sports facilities as well as a wonderful view of the R eis Magos Fort. Dune buggy trips are enjoyable and exciting – com emoҫão (with emotion), as the buggy drivers say - but they are by no means always accident-free. Choose only drivers accredited by Setur, Natal's official tourism office. The driver`s accreditation sticker must be visibly displayed on his vehicle, which should also have red license plates. Drivers should also always present a card showing their accreditation number. Higher-end hotels can recommend reputable agencies and drivers. There are numerous options for trips. The most common route departs from Natal heading for the dunes at Genipabu, the Pitangui lakes, and the golden dunes at Jacumã. Other trips terminate at Cabo de São Roque, Touros, Galinhos, or Pipa. The most extreme route goes from Natal to Fortaleza (one-way only). This route takes four days and requires overnight stops. Try to arrange meal breaks in advance, avoiding establishments that pay drivers commissions. On the north coast, we recommend Mercado da Redinha . The 13 kiosks at this Redinha neighborhood market feature such classic delicacies as tapioca with ginga (tiny fish caught with a fine net known as a rendinha). Genipabu is most famous for its dunes. The town sits across the Rio Potengi from Natal, in the municipality of Estremoz. From Natal, drivers can reach Genipabu on the RN-302 and RN-304 highways; a ferry makes the 20-minute river crossing to Genipabu's Redinha district from the point known as the rampa in Natal. The dark color of the Lagoa de Genipabu lake (unsuitable for bathing) is a stark contrast to the dunes that surround it. This and other surrounding lakes are actually large pools of seawater stranded among the dunes. The local couple Cleide and Philippe was so struck by Genipabu's similarity to the Sahara desert that they imported one-humped camels. The 14 dromedaries are now a popular tourist attraction at a sire known as Dromedunas (Genipabu beach). Despite being a state-protected environmental area, Genipabu Beach is cluttered with vacation homes, bars, and dune buggies. One of the more relaxing spots on the beach is Bar 21, a wooden deck mud the dunes. To reach the beaches beyond Genipabu, take a short ferry trip across the small river. The first beach you'll reach is quiet Praia de Graҫandu, which opens onto the Pitangui dunes and the brown waters of the Lagoa de Pitangui. The tables and chairs at the water's edge by Bar da Lagoa are a great place to relax. Just beyond Graҫandu are the vast Dunas Douradas (Golden Dunes), also known as the Brazilian Marocco dunes, which are covered in low-lying vegetation. The jacumã dunes are the last stretch of sand after the Dunas Douradas. To reach nearby Jacumã Lake, take a ride on the ingenious homemade tram, a cloth chair rigged to a complex pulley system. A ropepulled cart will convey you back. Cabo de São Roque is Brazil's second-closest point to Africa, after Ponta do Seixas in Paraiba. Known as the "Corner of Brazil ," this 6-kilometer spit juts into the sea some 50 kilometers north of Natal, just after Barra de Maxaranguape beach. The terrain is largely dunes, coconut groves, rocks, and cli ffS , punctuated by the famous arvore do amor (love tree) - two fig trees whose interlacing branches form a heart. Also of interest is the Farol de São Rogue lighthouse. The very stony beach is not suitable for bathing. Like most of the north coast, Cabo de São Rogue is easily visited by dune buggy or 4X4 vehicle from Genipabu. The main attraction of the tiny fishing village of Maracajú (60 kilometers north of Natal) is its precious coral reefs, known locally as parrachos. The reefs occupy a 13 by 2.5 kilometer area some 7 kilometers out to sea. Boats head to the parrachos at low tide, when the warm waters are shallow enough (1-3 meters) to offer good visibility for snorkelers. Divers see fish, rays, and with luck, lobster and shrimp. Maracajaú beach, surrounded by dunes and coconut groves, features calm seas and natural pools. Restaurants cluster around Farol Teresa Panҫa lighthouse. Agencies in Natal can book one-day "package" trips to Maracajú. Road conditions are extremely poor in the rainy season (June to August) and signage is inadequate; a guide is strongly recommended. Dune buggies also make the trip across the sand to the reefs, though these trips are limited by the extent of the tides.